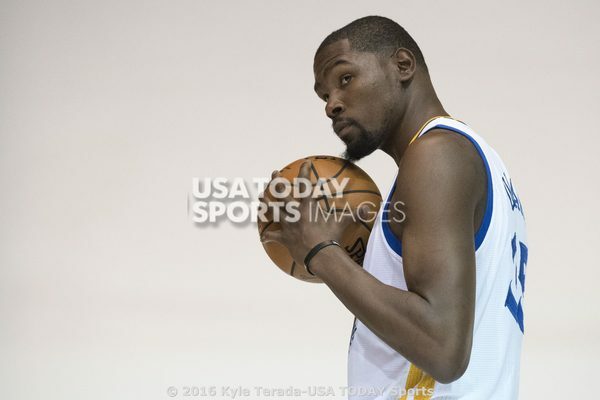 The Golden State Warriors participated in Media Day at their downtown Oakland practice facility, which gave fans an in depth look at a team poised to put on quite a show this season. There were some very interesting subjects that were touched on by various players, including Kevin Durant joining the Warriors. Durant has emphasized in the past that he was impressed with the team’s chemistry and talent, but considering what he had said about LeBron James joining the Heat in 2010, it seems strange that Durant had such a change of heart. Durant tweeted back then about a lack of competitiveness amongst NBA players, lamenting about the trend of super teams that was forming. Fair enough. It doesn’t take a great deal of introspection for a typical person to realize they’re a very different person from six years ago. We’re always evolving our worldview, and Durant should be applauded for becoming more enlightened on a specific issue. His teammates were naturally asked about Durant’s presence on the team, and Kevon Looney pointed out that he was compared to Durant back in high school, and how great it is to be on the same team as him now. Much has been made of Durant’s talent as a player, but he can also be a mentor for young players like Looney who’ve clearly looked up to him for a long time. This is setting up to be a fantastic season for the Warriors, and Durant makes an impressive roster even more formidable. Look for Looney to pick his brain a bit over the course of the year.